Hi guys! Since Valentines day is next week, I thought it'd be fun to offer something a little special and out of the ordinary for this week's giveaway. 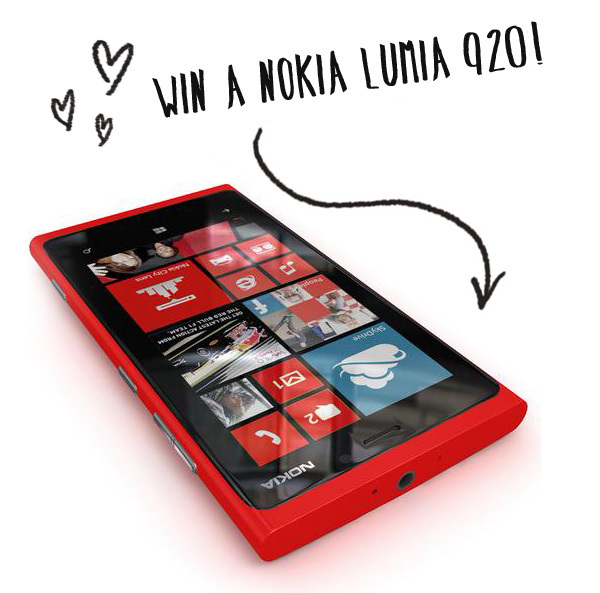 Today I'm partnering with AT&T to give away a brand new, bright red Nokia Lumia 920! I currently have an iPhone 4s (with a broken screen because apparently I can re-side a house without breaking it, but can't stand in the kitchen for two seconds before I drop it), but I've seen these around and I kind of like the big screen! All the better to take pictures with, amirite? If you've already got a phone you're happy with and aren't looking to upgrade, consider entering to give it to a loved one who is in need of a new phone! If you don't win, but kind of got your heart set on it, AT&T is offering a buy one, get one free deal on the Nokia Lumia 920 until Feb 21st! Then you and your loved one can have a new phone. But anyway, you probably want to get to entering. Just follow the directions below and you'll be entered to win! The phone will operate on AT&T’s network and wifi. If you win and you're not an AT&T customer, you have three options: 1) become an AT&T customer, 2) use the phone with wifi – all of the phone’s features (i.e., Facebook, Apps, Twitter, Calendar, Web Browsing, Contacts, Games, Linked In, etc.) will work on wifi with the exception of making calls and text messages. It’s like having a mini tablet (this is what I did with my iPhone for months before my previous phone kicked the bucket). 3) you could sell it – a new Lumia 920 retails for approximately $450 without a two-year wireless contract. Please note that the giveaway is open only to those in the US, sorry for the inconvenience!